we only have one bathroom in our house, which means that not only do we have to share one sink with each other, but we also have to share our entire bathroom with guests. before we got married i thought only having one bathroom would be an issue, but it really hasn't been. of course, if we both ever get a stomach bug at the same time that will be interesting. having one sink in the mornings means that Thomas gets up 20 minutes before i do so he can be out of the bathroom by the time i wake up. i'm sure he doesn't prefer to get up earlier, but it's worked well for us and he doesn't mind. for only adding two pieces of new furniture, we added a lot more storage space & it's so nice to have room for everything. 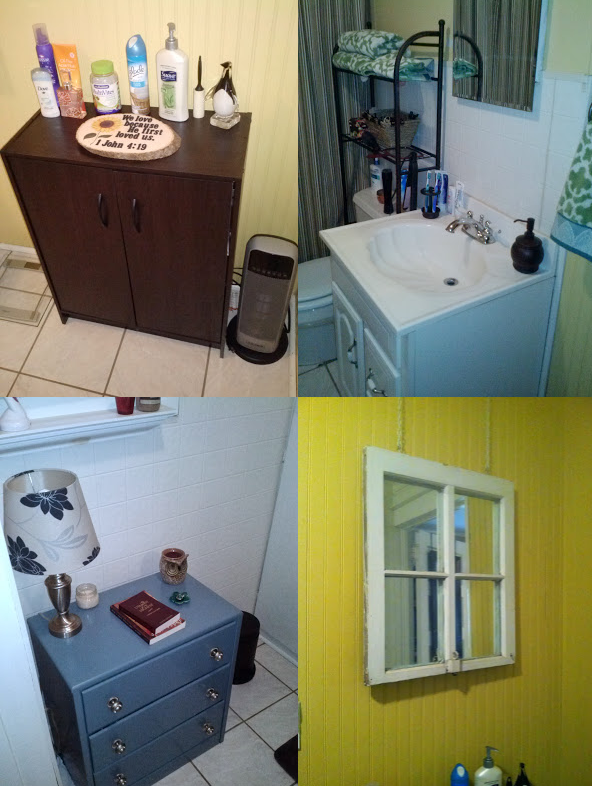 the blue cabinet was done by his mom when he moved in, but we did add the lamp shade that matches very well. the hanging window mirror was also done by his mom - she made it from an old window on our house when they replaced the windows. i love it & it's probably my favorite part about our bathroom! 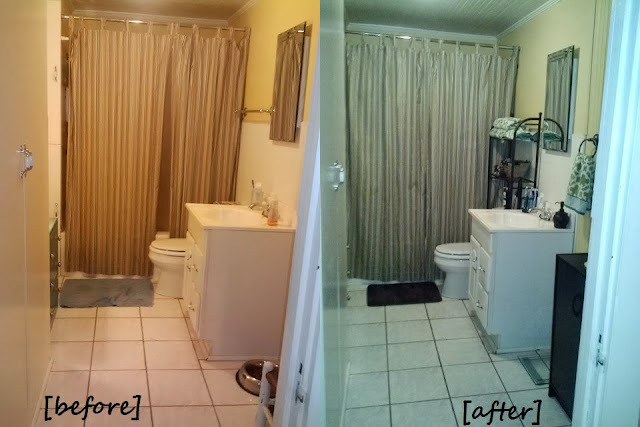 a bathroom is a really strange thing to get excited about, but i really do love our bathroom so much. it's a cozy little area, which is what i think we all look for in a bathroom! I think you need to come decorate my house!!! It's nice to have lots of storage in the bathroom (i know we definitely need more). We have 1 1/2 baths but our main bath is small... so storage is a challenge. Good work! That's fun! Yes, I agree that bathrooms are hard to decorate. Your bathroom looks so spacious! And I love your decorations. The bathroom is one of the only places we "argue" about - I believe Daniel called the sink a "Horcrux." We don't have near as much room as y'all do - and only one person can be in there at a time. I usually go first, but I don't mind. yes! the more storage, the better!!! :) thanks so much, Jennifer!! haha i love that he calls the sink a horcrux!!! so true! I like your new towel rack!! Definitely adds something both pretty and practical to the bathroom!